Sedgemoor South Services has undergone a £4 million pound investment. The challenge for Roadchef was to create a flagship site that would set a precedence for all future locations. They wanted to create a wow factor for visitors that could be seen as the best in the motorway service business. AR Media were engaged to provide Ultra High Definition 4K content that would highlight the new look and excellent in class that Roadchef were trying to achieve. The whole project had a tight deadline for both hardware and content creation, so the race was on to complete the project in under 8 weeks, ready for the grand opening. 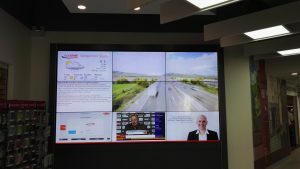 To bring this vision to life,a large UHD video wall was constructed and installed, consisting of a multi-zone layout design, with live Sky news and high impact full screen montages. Dynamax were asked to provide the digital signage software that would power this spectacular display. Working with AR Media to implement the solution Dynamax was able to assist in hitting the deadline, making the presentation to top executives at Roadchef a great success. AR Media are providing a fully managed end to end service of ongoing content creation, deployment, training and 24/7 system support, back up with support from Dynamax. 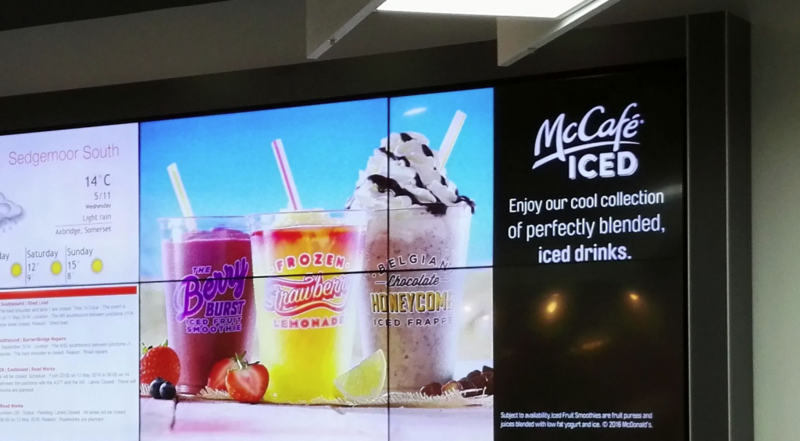 Do you require digital signage? Speak to us and see what Dynamax can do for you. This entry was posted by Dynamax. Bookmark the permalink.